This is a photo of the Cuckoo Stone, a Neolithic or Bronze Age standing stone near Woodhenge in Wiltshire. It is a short walk from Amesbury, where I stayed between visiting Stonehenge for the Summer Solstice and going to Glastonbury Festival. 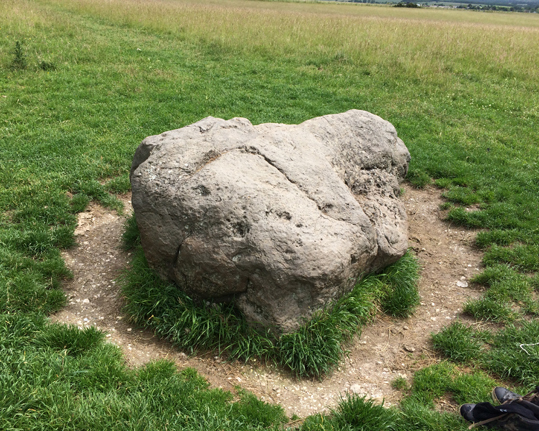 The stone is a fallen sarsen. According to one tale it was dropped there by the Devil, who was credited with the creation of Stonehenge. There are actually a few other Cuckoo Stones in other parts of the UK - particularly in Scotland where term gowk stane, which translates as cuckoo stone or fool's stone, is often given to solitary standing stones and glacial erratics (boulders left when glaciers melted). In folklore, the cuckoo is sometimes said to call the souls of those who have died with its song and be able to travel between the worlds of the living and the dead. The photo was taken by my hubby on his iPhone as my camera wasn't working at the time.